If you’ve been fishing, hiking, cycling, canoeing or simply travelling for a while, you’ll have some washing to do! 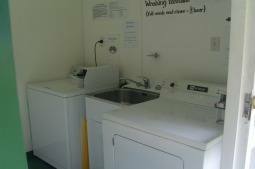 We have a coin-operated washing machine and tumble dryer, laundry tub for hand washing, and outside washing line with clothes pegs. The laundry room is always open and we have washing powder sachets to purchase from the office. An iron and ironing board are available on request.